LPK7.com is The fastest Website Maker in the world. Since 2007. The absolute fastest way to create a free website is www.LPK7.com. Here are just a few of our awesome features. & much more, for less money than anybody else. When your current provider simply doesn't give you the "bang for the buck" value you need anymore, you use LPK7. How-to Create A Free Website in LESS THAN 5 SECONDS? 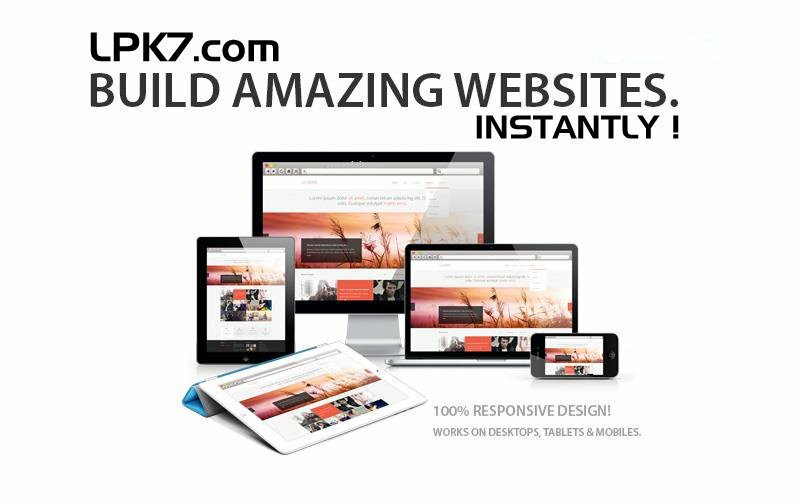 The Fastest Instant Website Maker - LPK7. If you do not subscribe for premium feature access, you can simply keep the free version of your website. We do not run advertising on your website nor do we sell your personal information. The Fast, Free, Easy Website Builder. Easy to use, Simple to learn, Automatic and loaded with everything you need, instantly. Do it yourself (DIY) Websites, generated in less than a few seconds means that this is the fastest business site maker on Earth, since 2008. You can instantly make changes to your site anytime you like without losing any information. Now, that is convenience. Make Landing Pages in SECONDS not hours. Your page comes with the features you need to collect leads (Lead Generation) and build your email list(s). This is a simple solution to a seemingly complex problem that does not require time, resources, a webmaster, web developer or hosting provider. This is instantaneous gratification at up to an 80% savings compared to other services. F.A.Q's - Frequently Asked Questions - About Our Website Builder. Q. Will LPK7 run ads on my website? A. NO. If someone wants to run ads on your website, they need to pay you. If your provider does that and doesn't pay you then why do you let them? Q. Do I have to build my own website using a complicated drag and drop interface that I cant understand? A. NO. If someone wants you to build a website using a complicated interface then they need to pay you. You are not a Webmaster. Our interface uses templates and is instantaneous and automatic. Also it has been used by people in every known country who have proven beyond any doubt that it is easy to use. Q. What is the cheapest way to make a website? A. LPK7 is the cheapest way to make a website on Earth. If you do not use any premium functions then it is FREE, no cost, Gratis. If you do use premium features then you can save up to 80% off what the other providers charge. We will beat ANY price from ANY provider for the same functionality (if available). Q. What is the fastest way to make a website? Q. How to build a website quickly? A. LPK7 is the record holder, automatic and everything is included. There is nothing to install. There are no modules to update. Nothing is faster. Anyone who says they are faster is free to challenge us on live television in front of an audience at any time. As a matter of fact, we double dare you. Q. How to get a secure eCommerce website up and running? A. LPK7 includes eCommerce, automatically and instantly. PayPal buttons are built in and you can use your Converge/Elavon, PayFlow, Global or Authorize merchant account. There is nothing to install. No guru is needed. All of our payment integrations are out of scope of the PA-DSS and secure. You do not come into contact with any payment information as we only use secure payment forms. LPK7 websites are covered by a secure certificate so all connections to this website or any sites it generates are secured with a minimum of 256bit security This is well in excess of the standard required by other providers. If you use your own custom domain name then you must also use your own certificate, which you can get for FREE from Cloudflare. Your site visitors and your merchant services provider will check your site for the GREEN LOCK in the address bar which signifies that the site is secure. All web browsers will show this and some will warn you if the site is not secure, immediately.If your provider does not provide a secure website automatically then LEAVE THEM IMMEDIATELY as this is a 100% requirement of all legitimate websites and your site will rank lower without a secure certificate. Q. What kinds of instant websites allow SEO? A. All websites from LPK7 feature actual working Search Engine Optimization tools onboard. You do not need any previous SEO experience to use them and they actually work. We do not need to scam you with ridiculous guarantees nor do we charge extra for these standard tools. Our websites out rank the sites from other services because they are built correctly. The web engine that runs LPK7.com has been used by people in every country on the planet and from all walks of life, who have proven it is easy to use. This is what to use when the other website builders are too slow, too complicated, too expensive or don't have the features you want. If you find a better deal, then you should take it.